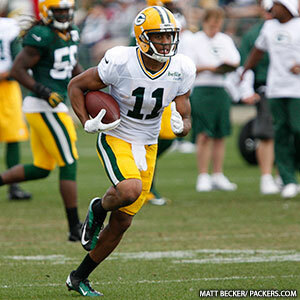 The Carolina Panthers officially announced the signing of former Packers WR Jarrett Boykin on Friday. A free agent signing by the Packers in 2012 out of Virginia Tech, Boykin was a restricted free agent. Boykin appeared in 39 regular season games for the Packers from 2012-14, with 57 receptions for 731 yards and 3 TDs. As per team tradition, the Packers select game captains each week. Today’s captains will be WR Jarrett Boykin (offense), CB Sam Shields (defense) and FB John Kuhn (special teams). The Packers coaching staff awarded four game balls to players for their individual performances in the 31-13 victory over the Browns on Sunday. On offense, the honor went to WR Jarrett Boykin, who led the team with eight catches for 103 yards, including a 20-yard touchdown. It was Boykin’s first career 100-yard game and first career TD, all coming in his first career start. On defense, game balls were awarded to CB Davon House and LB Jamari Lattimore. House snagged his first career interception on an early fourth-and-1, and later in the game, he broke up two passes around the goal line, one on a fourth-and-15 deep throw intended for WR Josh Gordon. Lattimore led the defense with nine solo tackles and 12 total tackles, including his first pro sack and a deflected pass. On special teams, CB Micah Hyde received recognition for his 18-yard punt return early in the game to help set up Green Bay’s first touchdown, and for two tackles on the coverage units, including one of Browns KR Travis Benjamin to prevent a TD at the end of a long return. –Boykin, Jolly stand out: Undrafted rookie WR Tyrone Walker has received a lot of attention lately, but second-year pro Jarrett Boykin isn’t about to give up his roster spot that easily. Boykin had a strong practice on Tuesday, making several catches working with both the regular offense and scout-team offense. Boykin made a nice grab on a comeback in traffic, a diving catch of a slant from QB Vince Young and later a spinning catch in the middle of the field. He nearly capped off his day by hauling in a deep ball from QB B.J. Coleman along the sideline, but the throw was just out of reach and bounced off his outstretched hand. DE Johnny Jolly was another player who looked to be having a strong practice. In the one-on-one pass-rush drill, Jolly slipped by G Greg Van Roten with a quick spin, and then he beat C Patrick Lewis with a swim move. It should be noted that Van Roten then bounced back with strong reps against DE B.J. Raji and DE Mike Neal. –Kickers perfect: Both Mason Crosby and Giorgio Tavecchio were a perfect 8-for-8 on field goals in another head-to-head duel. The kickers kicked two series of four kicks, the first from 33, 43, 48 and 50 yards, and the second from 34, 39, 45 and 54 yards. As has usually been the case, Crosby’s kicks have carried a longer distance, and it’s especially noticeable on the longer field goals. The day prior, Crosby was 7-for-8 and Tavecchio was 8-for-8, meaning the two kickers have combined to go 31-for-32 over the last two practices. –Hayward still out: Mike McCarthy made it sound as though the return of CB Casey Hayward, who has not practiced all training camp due to a hamstring injury, was not imminent, though his medical reports have improved. A defensive rookie of the year candidate last year, Hayward led all rookies in 2012 with six interceptions. –Pickett misses practice: DE Ryan Pickett missed practice due to a personal matter. He indicated on his Twitter account that he had to take one of his children to the hospital, but everything is fine. G T.J. Lang (back) continued to sit out, as did fellow lineman Andrew Datko (concussion). McCarthy said Datko is “getting close” to passing the tests that are part of the concussion protocol. –Bostick showing up: With injuries at tight end to Andrew Quarless (quad) and now Ryan Taylor (knee), practice-squad holdover Brandon Bostick is starting to show up more on the practice field. In the scrimmage on Saturday night, Bostick made a tough catch in traffic over the middle. Then on Tuesday, he caught two TD passes during red-zone work. The first was on a quick flip from QB Aaron Rodgers over the middle that appeared to be an audible at the line. The second was on a crossing route thrown by QB Graham Harrell. Bostick caught it right in front of CB Jarrett Bush and absorbed a hit from S Chris Banjo at the goal line. He nearly turned a good day into a great day, but he couldn’t haul in another potential TD pass from Rodgers on a difficult catch at the goal line with Bush in tight coverage. Bostick also continues to work on his blocking, and on one play he handled Nick Perry’s outside rush OK, though he wasn’t totally satisfied. That’s a tough task for anyone against Perry, but Bostick is quietly improving this camp. Now he has to keep showing growth when the preseason games start on Friday. –Injury update: Head Coach Mike McCarthy said Taylor would be “week to week” but he didn’t think he’d be out long. WR Jordy Nelson had a procedure done on his knee and is out for the remainder of the preseason, at least. RB Alex Green (knee) and DE Datone Jones (illness) also missed practice, while WR Randall Cobb (bicep) and DL Johnny Jolly (cramps) left the workout early. LB Dezman Moses and S David Fulton both returned to practice after missing Saturday’s scrimmage. –Harrell follows up: After a solid showing in the scrimmage, backup QB Graham Harrell was productive again on Tuesday. In the red-zone work, in addition to the TD to Bostick, he also hit WR Myles White on both a slant and a quick out for TDs with pinpoint throws. Later, he connected with WR Alex Gillett in the back of the end zone for another score. –Boykin steady: At the start of camp, WR Jarrett Boykin was considered the front-runner for the No. 4 receiver spot, and he’s done nothing to lose his hold on it. On Tuesday, he made an impressive sliding catch on a deep ball in a one-on-one drill against CB Brandon Smith, and then in the no-huddle period to close practice, he made two nice catches on throws from Rodgers, the first a back-shoulder ball along the sideline, and the second a slant on which Boykin took a big hit from S Jerron McMillian but secured the catch.